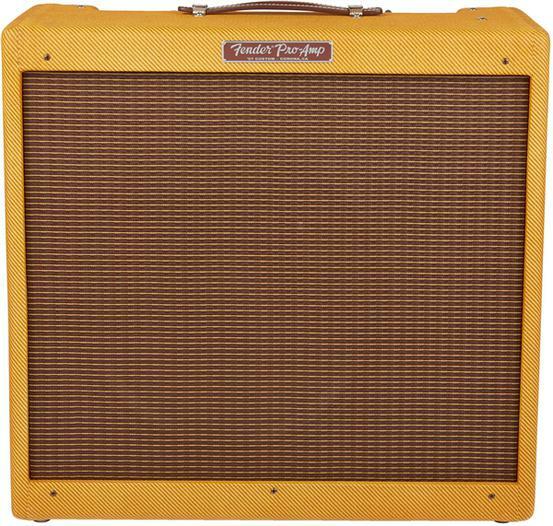 A reimagining of the never-before-reissued tweed Pro Amp, the hand-wired 57 Custom Pro-Amp replicates classic Fender tone with style. This sonically flexible amplifier is built around a vintage all-tube circuit with rich, sparkling clarity and creamy overdrive when turned up. Not only are its harmonically rich clean tones perfect for recreating classic guitar styles, its the ideal tonal canvas to create new sounds with todays pedalboards. The original 5E5A circuit that powers the 57 Custom Pro-Amp is a Holy Grail circuit, renowned for its tonal flexibility. A single 12AY7 and pair of 12AX7 preamp tubes are matched to a duet of 6L6 power amp tubes and single 5AR4 rectifier tube for classic, highly dynamic tweed tone. The addition of a presence control adds adjustable upper harmonic overdrive to dial in just the right amount of sizzle to your sound, making it come alive with depth and clarity. The interactive bass and treble controls grant this powerful amplifier even more sonic suppleness, allowing players to unleash their personal tone. The hand-wired circuit includes newly sourced yellow coupling capacitors chosen for authentic vintage Fender tonesparkly cleans and creamy overdrive with smooth top end and round mids. A single 15 8-ohm Eminence Special Design speakerpowered by 26 watts of pure Fender tube tonecranks out plenty of vintage tone with robust low end and vibrant highs with medium breakup when pushed. The 57 Custom Pro Amp also sports the legendary warm, golden look of vintage tweed along with classic chickenhead control knobs, top-mounted controls, leather handle and dual input jacks to accommodate both low and high output instruments. When you plug into the 57 Custom Pro-Amp, youre plugging into a piece of history. Includes a protective cover.